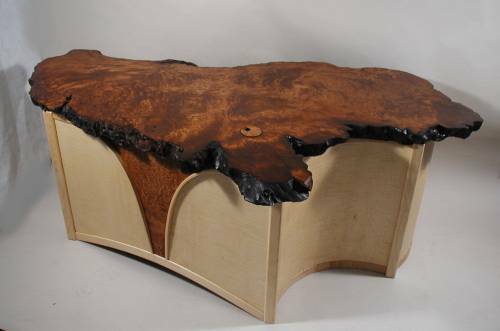 This redwood burl slab desk was designed around the free form shape of the highly figured burl slab. It measures approximately 80" x 42" x 30". The curly maple was selected to add a lighter feel to the rich red color of the slab. The desk has five sides and a different focal point of interest depending on the angle of view. The curved lines and unobstructed form is maintained by placing the CPU on a shelf underneath and all components and the printer on rollouts behind a door. The front panel has a cascading face broken by the highly figured redwood burl which gives a dimensional view and the feeling of a hidden core or layering. The curved sides maintain the same flow as the redwood burl slab top. Some of the very interesting design challenges to this desk were to hide the client's hardware while maintaining the overall shape and feel of a free form slab. I did not want a boxy or straight retangular base that would interfer with the lines of the beautiful slab that the client had selected.